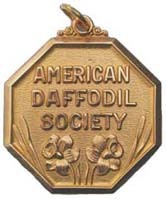 The Gold Medal of the American Daffodil Society shall be awarded to an individual deemed by the Honors Committee as being worthy of “recognition of creative work of a pre-eminent nature in the understanding and advancement of daffodils.” Nominees need not be citizens nor residents of the United States. Below are the Gold Medal Recipients listed by year. Click on the PDF symbol to read the citation.